Hau Giang (VNA) – A project partly funded by a World Bank loan is being carried out in the Mekong Delta province of Hau Giang, aiming to help more than 26,000 farming households adopt sustainable agricultural production practices. The Sustainable Agriculture Transformation Project for Vietnam (VnSAT) has a total investment of more than 300 billion VND (12.9 million USD), including nearly 190 billion VND loaned by the World Bank. The project is being run from 2015 to 2020 in six district-level localities with 32 communes. It aims to help increase net profit on each hectare of rice production by 30 percent while raising the area of sustainable rice cultivation under contracts with businesses to more than 7,000 hectares. It also aims to have some 10,000 hectares applied with the practices of “three decreases – three increases” (decreasing the amount of seeds cultivated, pesticide and fertiliser; increasing rice productivity, rice quality and economic efficiency) and “one must – five decreases” (must use certified rice varieties; and decrease the amount of seeds cultivated, pesticides, fertiliser, water and post-harvest loss). 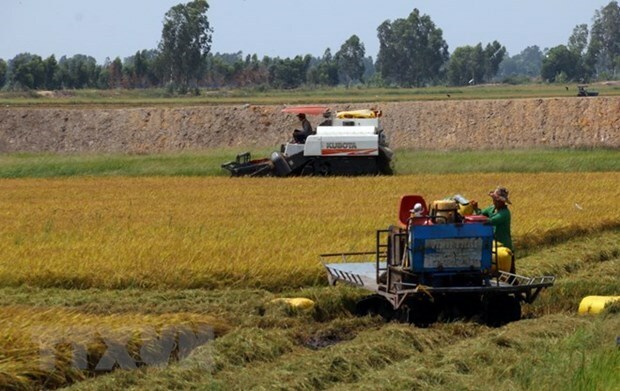 At a meeting on April 10, Vo Minh Phuc, Deputy Director of the province’s VnSAT management board, said Hau Giang will press on with this project so that by 2020, more than 26,000 farming households and at least 16 farmers’ organisations and cooperatives are supported in terms of infrastructure and equipment to practice sustainable agriculture. Under the project, farmers will be instructed to use by-products of rice cultivation, rotate crops, produce certified varieties and follow Vietnamese Good Agricultural Practices (VietGAP). Tran Hoang Nho, Director of the Danh Tien Cooperative in Xa Phien commune of Long My district, said the cooperative’s members have participated in many training courses under the project. By adopting sustainable practices, they have reduced the amount of seeds needed from 20kg every 0.1 hectare to 10kg as well as fertiliser while rice productivity remains unchanged, leading to higher profits.